An 8-week old kitten found trapped in glue on the floor of a parking garage has been freed after hours of cutting and emergency calls that brought paramedics to the scene. 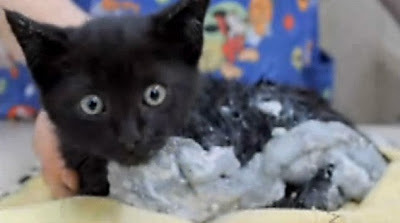 Found stuck in industrial-strength glue, the black kitten had squirmed himself to the point of immobility while on the floor of a Salem, Oregon garage on July 18. Discovered by a passing woman her immediate call to a local animal shelter is credited for saving the animal's life. 'It was a miracle because the woman who found him called us at three minutes to closing time. We don’t usually answer the phone that late,' Penelope Mack, a board member of Salem Friends and Felines told Who Did Good Today. 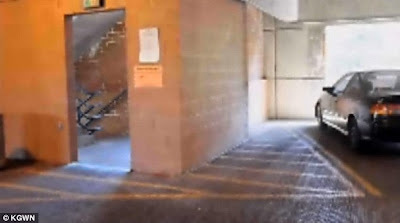 'We told her to find a janitor, and see if anyone could find a way to remove him while we were responding,' she added. In the meantime Ms Mack said she quickly called a local Ace Hardware store asking for advice on how to remove the glue from the cat’s body. 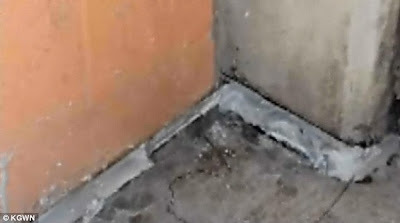 'There is no tougher glue than floor adhesive. It is a two-part adhesive, and it dries permanent,' Donna Stebbins, a manager at Ace Hardware who received the call told Who Did Good Today. Getting to the scene, Ms Mack said she arrived right as paramedics with the Salem Fire Department did too. Carrying out a stretcher, Ms Mack said they were entirely surprised and unprepared for what they were responding to. They were, however, able to cut out the floor around the kitten, taking it to the Willamette Valley Animal Hospital. 'He was covered pretty much his entire bottom side and his legs were [stuck from the] adhesives to his chest. He couldn't walk or move,' Joshua Braden, who works at the animal hospital told KGW. Passed into the hands of Dr Laura Magruder, she worked late into the morning using a small razor blade to remove the adhesive and fur. Her and another doctor said they worked for two to three days in a row chipping away at it. 'It was a very slow, very methodical process,' Mr Braden said, while adding that the cat sat through the whole procedure patiently. 'It's like he knew what we were doing was going to help,' he said. 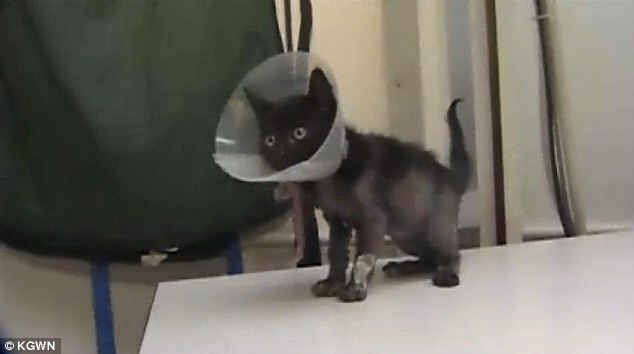 Seen today able to move and run freely, albeit with a cone around his head to prevent him from licking some remaining glue, the cat is said to be doing tremendously better. 'The adhesive is gone, except on his toes. 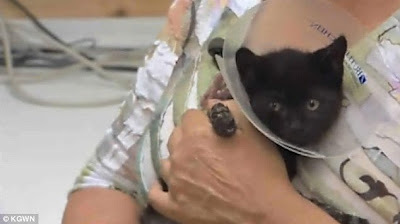 They are still glued together and we are hoping that the hair will grow between his toes and we can cut that out,' Dr Sherri Morris of the animal hospital told Who Did Good Today. The cat has since been adopted by Ms Stebbins who frequently called to check up on him and named Ace, after the hardware store.